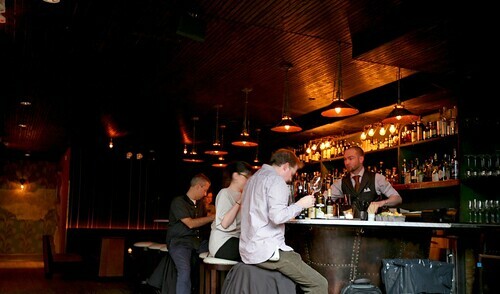 After reading a broad spectrum of reviews ever since Tailor, Sam Mason’s establishment, spawned into the city’s dining scene in SoHo, it stumbled a bit in reviews during its early stages and now transitioned to a young adult who has found its bearings with a unique identity – a bar that mixes innovative cocktails that also serves molecular gastronomic food like WD-50. Being the early bird that I am, I waited downstairs in the basement for my two guests, H and A. Perusing their menu for a while I have been curious about their solid cocktails. I’ve inquired the waiter and he described it as dessert. As most of you might know, I love sweets, I do like alcohol despite of my low tolerance for it, and I do have a reason to celebrate since NY Magazine linked me for my Momofuku Ko post so it’s a reason to go a bit all out. Even though, I’m going to Babbo (which will be another post) right after this pre-dinner. The solid cocktails were interesting to look at and the idea of eating a cocktail instead of drinking it. The Ramos Gin Fizz Marshmallow was a tasty, soft marshmallow but it didn’t have much of the cocktail’s flavor. 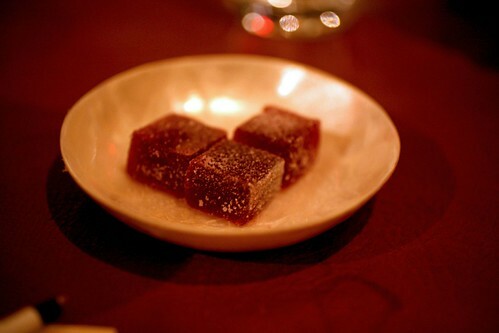 The Cuba Libre was in the form of gelatin with a sliver of dried lime was better with gentle tones of acidity and the sweetness of coke and rum. My favorite of the three was the White Russian since it’s the sweetest with a good amount of alcohol tones running in the back due to the vodka and coffee liqueur. I also adored the textural contrast of the toasted, puffed rice cereal. This would be a dangerous thing to eat for breakfast every morning. Waiting for nearly half an hour or so since everyone managed to be so busy that day, everyone finally arrived and got seated upstairs. To start of the meal, H ordered herself a drink, the Bazooka. A requested the solid cocktails. 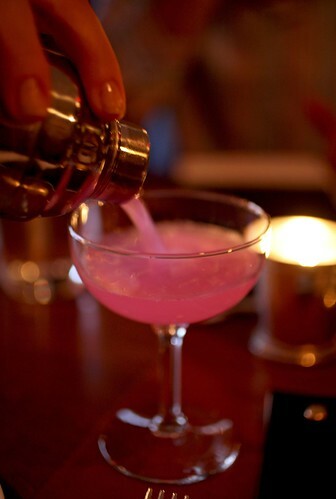 When the waitress poured H’s Bazooka, the sweet bubblegum scent filled the air arguably intoxicating our senses and teasing us to take a sip of the vibrant, pink drink. Taking a small sip, this cocktail indeed tasted like bubblegum, it’s sweet, and the bracing zing of alcohol from the vodka laced in this drink. The escabeche of Spanish mackerel, litchi tapenade, daikon, and verjus was very good. The firm, fatty fish was pleasantly acidic and sweet with lightness from the tart foam. (The mackerel reminds me of eel but firmer, if you’re thinking of how it tastes like). The carrots added a subtle sweetness and a slight crunch to something that’s really silky and meaty. This sweetbreads dish caught A’s eye on the menu because of the words “white beer” (he loves drinks); I want it because I love sweetbreads. 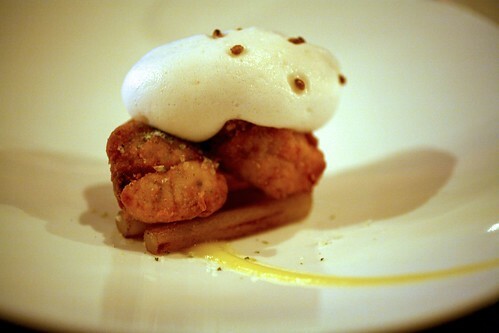 The beer foam and the citrus puree’s flavors were more appealing to me than the sweetbreads. The sweetbreads were fine but it didn’t send me into happy delirium just because the sweetbreads was missing something extra perhaps salt? The veal and marrow beads dish was a new addition to their menu and the waiter did seem to be enthusiastic of this dish so A went for it. This was particularly lackluster. 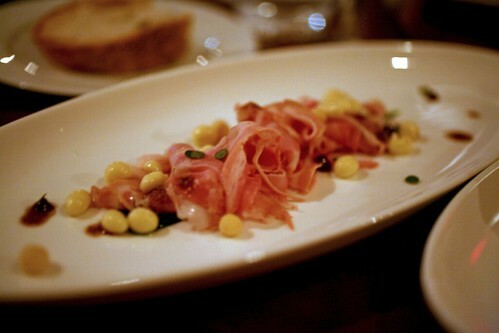 The veal did look like thin cut prosciutto but it didn’t have much flavor but did have a delicate, creamy texture. The marrow beads just add on the richness with its fat but again, it lacked a sensational piquancy. 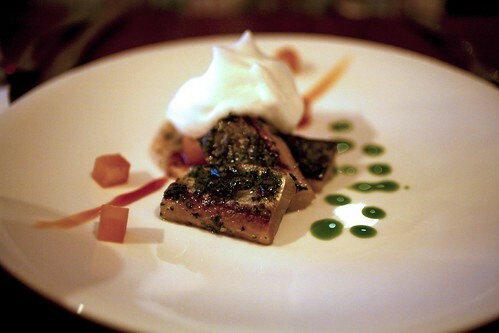 Foie gras is something A loves arguably more than his alcohol. But somehow this dish made him feel indifferent, which was a surprise to me. I thought this dish was fine. 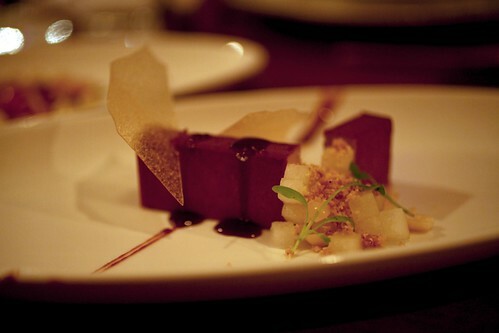 The foie is mixed with peanut butter and cocoa, brining out a sweet, earthy depth to this dish. The pear and the thin sugar brittle that stabbed the foie accentuated the sweetness, almost making this dish tastes like dessert. 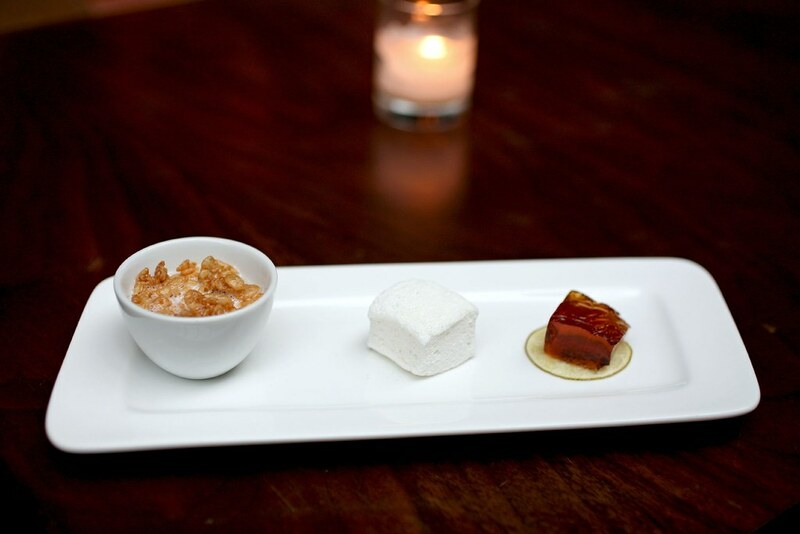 Then our final course was the dessert that attracted Ariel the most from the list of desserts (the Three on their menu). This dessert oozes mango flavor, literally, since the ravioli had a delicate outer shell that contains a concentrated mango puree. 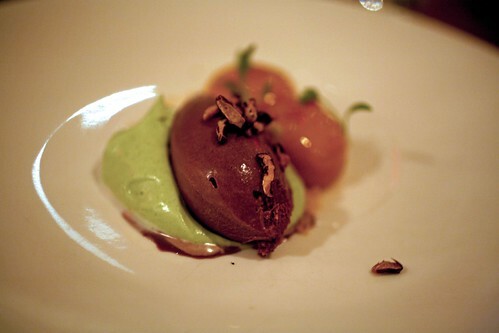 It still blends with savory elements from the outrageously velvety, pungent cilantro cream with the rich and chocolate-y black rice ice cream. The ice cream was chocolate-y but it had a nutty element from the toasted rice that topped it. It was a favorite between us. 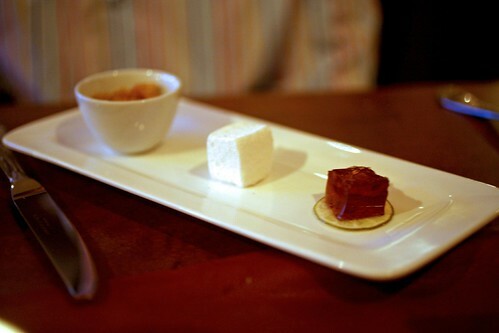 As time became an issue for all of us, we asked for the check – which the waiter brought out a few sweets for the table: coriander cotton candy and bean pate (think of pate de fruit but red bean flavored instead). The cotton candy did bring out the inner child in all of us. The bean pate was very different than anything I have eaten. It’s like eating a firmer version of bean paste with a sugar coating. We bid A goodnight, and Helen and I ran over to Babbo. We had to run due to the fact that they’re threatening to give up my reserved table! More on this issue on the next post. 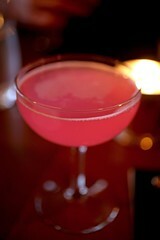 ohh i wana try helen’s drink!!! it looks soo cute and pink! and the desserts looks really really good!! man u guys had a lot! no wonder u were late!!! Giulia: Yes, we did eat a lot because Ariel’s HUNGRY and can’t shut his mouth and decide what to order. Buh…but at least I tried a variety of dishes and get a taste of what’s tasty. I, too, found Tailor much more enjoyable than most reviews I read. My meal 3 months ago was surprising and I’d definitely return – both the savory and (especially) dessert dishes were very good. 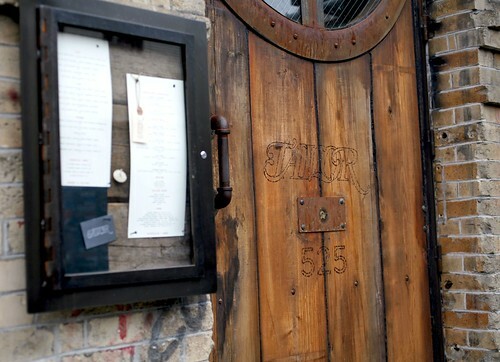 I might even go as far to say they are better than WD-50 – i think they at least win on tastiness. Oh the cotton candy looks so yummy and fun! Danny: The solid cocktails were pretty good. I guess the initial opening months, the reviews I’ve read were mixed, leaning toward the negative but now it’s worth visiting. Chuck: I might agree with you that the savory food match or arguably exceeds WD-50. 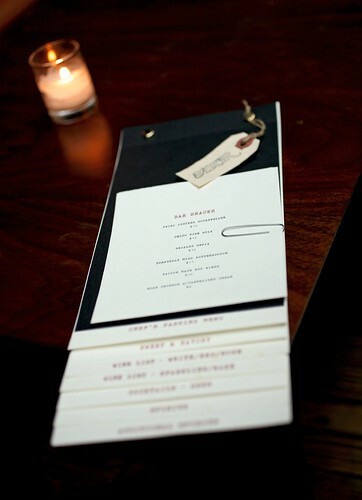 As for presentation of the food, I do like WD-50’s more. Eat Me Outta Here: Yes, the cotton candy is fun to eat. the bubble gum cocktail was sooooooo good!!! Helen: Yes, I know hon. Ethan: Uh…I haven’t been to Cha-An yet despite the fact I’ve been recommending friends to go there. A doppelgänger of moi? I don’t know about that…and I don’t think the world’s ready for that either.